Calling it the last upgrade you’ll ever do, Oracle CTO and chairman Larry Ellison yesterday unveiled “the world’s first automated enterprise cloud application upgrade product” which, the company says, will enable Oracle customers to reduce the time and cost of cloud migration by up to 30%. Using the “Soar to the Cloud” solution, which provides automated tools and cloud transition methodologies, customers with applications running on-premise can upgrade to Oracle Cloud Applications in as little as 20 weeks, according to Oracle. 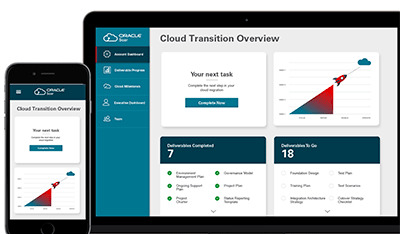 The first Oracle Soar offering is for Oracle E-Business Suite, Oracle PeopleSoft, and Oracle Hyperion Planning customers who are moving to Oracle ERP Cloud, Oracle SCM Cloud, and Oracle EPM Cloud. Outlining the steps in the Soar process, Ellison said, the automated upgrade includes an evaluator process which scans for customizations; a configuration analyzer that extracts configuration parameters, such as accounts, cost centers, employee hierarchy, and users; an auto configurator that automatically configures Fusion ERP; and auto data migration to extract data from Oracle E-Business Suite and PeopleSoft and load it into Fusion. Addressing concerns about customizations and integrations with other systems, Ellison said there is a large library of pluggable Fusion integrations for connecting to Oracle apps, plus other apps from SAP, Salesforce.com, and dozens more. For any additional customizations and integrations required, such as those with an internal system, he said, customers who take advantage of the Oracle Consulting Upgrade package receive a customization allowance for 30 integrations plus 30 custom reports. However, he noted, Fusion ERP has more features than EBS so many customizations and extensions would be replaced with standard Fusion ERP features, which should significantly reduce the need for customizations. Built on machine learning technology, said Ellison, Fusion ERP Suite is easier to use and provides more automation. It offers a modern user interface, and has hundreds of manual ERP functions automated, as well as an automated upgrade utility. In terms of platform security, said Ellison, all Fusion apps run on Oracle Database. There is automated threat detection and remediation and the database can patch itself while running with no delay waiting for human intervention or a downtime window. In terms of infrastructure security, he added, applications processors cannot access security processors' memory; security processors cannot access applications processors' memory; and technical staff running the Oracle Cloud cannot see customer data. Soar also provides a Fusion applications development environment called Visual Builder, a tool that Ellison said was used by Oracle to build Fusion applications and can also be used by customers to create custom integrations, extensions, and reports. Visual Builder incorporates mobile access, chat bots, and a voice user interface, as well as machine learning. In closing, Ellison emphasized that using Soar it is not only easier to move from E-Business Suite to Fusion than it was to move from one version of E-Business suite to another, but there are also many additional benefits, including the fact that "many tedious transactions that people were manually entering" are now automated by taking advantage of machine learning—from scanning of invoices to automatically matching budget accounts to actual performance. Oracle says it will continue to develop the product, extending the solution to Oracle PeopleSoft and Oracle E-Business Suite customers moving to Oracle HCM Cloud, and Oracle Siebel customers moving to Oracle CX Cloud in the future. For additional information on Oracle Soar, visit oracle.com/soar.